Halo 3: ODST is out this Tuesday, September 22nd, and despite our favorable review of the game, we had one major complaint - no co-op matchmaking. 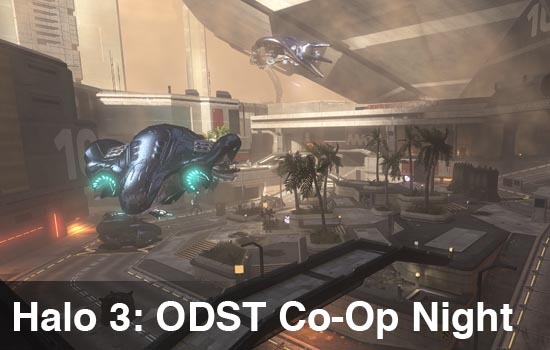 Thankfully we got you covered with our first of many ODST co-op nights. The party begins at 8PM EDT on Thursday, September 24th. We'll have the cooptimus gamertag up accepting invites. We'll invite folks off of this list or you can utilize the friends of friends feature to find other co-op gamers. Feel free to confirm yourself as a guest of the Event on Facebook as well! The Co-Op Experience: A brand new entry into the Halo universe as players take the role of an OSDT Marine. Players can play through the campaign or choose a survival mode called FireFight. Up to four players can play at once, with 2 players offline in split screen playing with friends online. Don't forget to check out our full review of the game! As we gear up for the night, listen to the Halo 3: ODST Soundtrack!